Market Sentiment Watch: In energyland week four has arrived for the 3Q13 reports and as usual it's going to be a very busy one. In today's post please find The Week That Was (including quick summaries of last week's reports as well our Misssion Accomplished thoughts on the oil price decline), the lastest macro data slide shows for natural gas (August data out of EIA), the earnings calendar for this week with comments for tomorrow's reporting names of interest, and a few other odds and ends. The ZMT currently holds small common stock positions in WPX, BCEI, HK and call positions in HAL (Nov $55s and $57.50s), SWN (Nov $40s), and RRC (Nov $82.50 and $85s - which are looking pretty ill fated after last week's retreat). Crude oil closed down 3% last week at $94.61 driven lower by another larger than expected headline crude build and a big build at Cushing. Product demand picked up nicely for both gasoline and distillates and imports did fall off more sharply as we have been expecting. Crude is trading technically and round number support rules are in play (in other words when $100 breaks, then $95 is often a likely magnet and when $95 goes, people start thinking about a possible test of $90. See more comments in The Week That Was section below. This morning crude is trading flat. Natural gas closed off 6% at $3.51 on Friday after EIA reported another slightly bigger than expected injection. We should get a bigger number this week due to last week's mildness before the season draws to close on smaller injections over the next couple of weeks. See The Week That Was section below for more comments. This morning gas is trading off a dime. Natural Gas Production Watch: Inched up to another new high driven by "Other States", Texas and Oklahoma volume gains and partially offset by Louisiana (which is down over 2 Bcfgpd YoY) and an ebbing Gulf of Mexico. Natural Gas Imports Watch: Holding near cycle lows and flat with the prior month at a net 3.5 Bcfgpd. Natural Gas Demand Watch: Second highest level of natural gas demand on record for August (first was the 2012 level). Industrial notched another record for the month and combined Residential and Commercial demand squeaked out another record as well. Tropics Watch: No activity underway as the quietest season on record comes to a close. Last week - heating degree days rose back up to 90 but still were warmer than the normal 100 for this week of the year. The forecast for this week for HDDs shows them moving up to 106 vs 115 normal for the week. NFX - Looking for commentary on whether the $898 mm offer for Malaysia is the final offer or not and timing on China (thinking 1Q14 now). Also looking for rapid growth out of Bakken, Eagle Ford, and Cana this quarter and through year end. We expect the Street to increasingly focus on the clean, less levered, domestic oil growth story that NFX will be in 2014. CRZO - Looking for another strong quarter. Look for them to give results of an Eagle Ford downspacing test as well as more Wattenberg results on the call. Not looking for a guidance boost on this call. FANG - We don't own it but will likely late this year or early next. Just keeping tabs for now. GST - Looking for a Hunton play update. GDP - We don't own the name but listen for color on the TMS. A) Yes, we can think of times when it was cheaper but probably less predictable or modelable from company specific standpoint. We don't see the current market as over valued but it's no long failing to disount crude prices by as much they were all Spring and Summer. A lot of times when things have gone to extremely cheap land it's due to a large market correction that included the commodities and drove prices into the ground. They were not cheap on near term valuation then and the unconventional oil side of the picture was less of a known thing, In our main Bakken plays now for instance, we see additional zones being proven economic and results becoming increasingly consistent. So we have the same real estate becoming increasingly valuable, pushing more of the downside risk a little further from execution and a little bit more onto price. To be clear, we are not fans of commodity prices that spiral ever higher and the names in the ZLT will do quite well in an $80 to $100 oil price environment and on the gas side increasingly well in a sub $4 / MMBTU environment. B) No, 2 to 3 years is our average hold time, pretty much irrespective of commodity prices. We generally buy and hold for many years. 2 to 3 is probably more of an average for our Cores. If we think we see a year of suppressed oil prices or one where prices could have a pinch point and spike up we have Trading positions on top of the Cores with which to add or remove exposure. C) Most companies acquire leases and exploit the underlying resources. Some explicitly state the company is being built for sale but we own nothing for that outcome. We'd own the old BEXP happily today had they not sold out too early to STO. The old HK comes to mind as well and with management teams we like, we really hate to see them hang it up for a one day pop. D) Yes we do. Consolidation is a fact of the business. So too are new plays. And there is a lot of land out there that from time to time looks next to worthless due to commodity prices (like the Permian did when oil was $12 back in 1998). Lots of land was swapping hands then too and much of that was held. People thought the Spraberry was a great thing then but the technology wasn't around to go after something like the Wolfcamp. LINE / BRY update - The two companies amended the merger agreement taking the exchange ratio up from 1.25 shares to 1.68 shares (they obviously had to agree to pay up given all the machinations since the time of the original deal announcement), valuing BRY at $4.9 B. Date for merger extended to January 31, 2014. The LINE is holding their call to discuss 3Q13 results and the BRY merger on Tuesdat at 10 am EST. If you use it to subscribe you will need to cancel your account. Apologies for the inconvenience but starting Nov 20, 2013, Google will no longer process payments as they are shutting down the program. This entry was posted on Monday, November 4th, 2013 at 7:49 am	and is filed under Uncategorized. You can follow any responses to this entry through the RSS 2.0 feed. You can leave a response, or trackback from your own site. Solar ETF TAN consolidating after run up. Weekly Uptrend intact. Next major resistance 50% higher. A number of strong charts pulled back to the vicinity of the 20 MA on Friday and either bounced or held. This often a buy point for those that buy dips on momentum. While this setup ("Holy Grail") has a good historical edge two issues standout. The small E&P group is now underperforming the market by quite a bit and there is little nearby defined support on the profile chars in the pullback setups. If the momentum buyers are going to start nibbling off the charts I would expect it to happen soon. WLL said to be sniffing around up in Michigan. The Collingsford Utica being drilled by ECA. If successful also very good for BBEP which was one of the top 3 MLP's recommended by UBS last week. MLPs as defined by the AMZ index was up 24.6% (the latest DVN/XTEX merger helped mucho). LINE news may add to performance here if successful with merger. UTY Utilities +13.6% and RMZ Reits +8.1%. APC eyeing a sale of more of their assets in China $1B. Another example of companies looking to develop here in NAM. Notes….. Market continues to build value and structure above previous breakout level. Current volume pivot at the 1754.50 CHVN. Near support 1743 CLVN. Far support 1730.50 CLVN. Market working off overbought levels through sector rotation into laggard and defensive groups. Big cap leadership. Demand volume positive. Breadth trend supportive, working off overbought levels. POMO injecting $10 billion this week. Thoughts ……… Expecting market to trade sideways above 1743 CLVN with a positive bias above 1754.50. 1730.50 is key short term support with volume gaps to 1716 and below. Guggenheim (Friday) Offshore – Put out a field by field rig supply/demand forecast. They indicate tighter floater market over the next few years contrary to the current bearish consensus in the space. They see entry point having favorable risk/reward. They like SDRL, NE, ATW & PACD. Those are the names I would stay with also. Thanks for the levels and comments, just getting back into the office. SDCJF – breakout extending this morning – see last Thursday's post for commets on the 3Q operations update … strong things happening for that little one. LINE – strong initial reaction to LINE having to really pay up to keep the BRY deal going. Hmm. SWN – have seen no post quarter follow up notes with target changes there. Bizarre. AR – earnings Thursday, initiations by a ton of sell side guys probably a week from today. The Sharp well cost $10 mm to drill due to some drilling troubles and extra science and it will still be economic. Saying the next well cost $7 mm and has an IRR they think of 80 to 90% … that's better than Bakken. Doing a lot of data stuff today, will be pretty quiet at times, shout if you need something. RRC – decidedly negative tone since the end of their strong quarter and good call (or so I thought). Not sure what their beef is, will try to see. Could also just be gas prices taking all of the little run into earnings back out. RE 17: COG struggling also since their report. Natgas pricing is weak and the weather forecast is for warmer than normal temps ove the next 6-9 days. Interesting that some other natgas names that have not reported yet are up today (WPX, CHK, AR), though these may have more of a liquids story to them and are not as expensive by certain metrics. re 18 – was that today? Can you see if that's Driscoll. I think he's smart but worthless on natural gas for the last… i dunno, forever. re 19 – hear ya on that, the RRC GIP maps are pretty important to the story but the names are largely trading around the yoyo action on natural gas prices. Kind of silly. Sharp costs. Still puzzled. 4 stages=$1.2MM, Extra string because of pressure=$.7MM, thats $1.9MM. Four cores=$1MM, now up to $2.9MM. Drilling to 10,500 with a string a 5000' cannot be $5MM more for a total under $8?? I just set a string of p-110 to 11,400' in pressure and it is at $3.5MM pre completrion. 20 Yes today. Will try to ask who. re 23 – hear ya. He said that they had some trouble drilling it that accounts for the extra cost but he didn't elaborate. Guessing long delay although not by my earlier notes. re 24 – 26 – thanks. And Reef – note those economics at $7 mm … 80 to 90% as you know is stellar. 450' thick, probably here them talk laterals in various unseperated zones of it down the road but hey, go vertical until you're sure. They also mentioned some really big areal extent on where they think this works, said they don't need the geopressured for the economics to work. Sounds like 1H14 is delineation time via verticals and 2H14 is acceleration time with 2015 being the first year of big drilling. Plenty of liquidity here to exploit a baby Bakken in the South with no need to punt to the midstream to pay for it. Next year we may get a slight oil wedge with Marcellus and Fayetteville both driving growth. 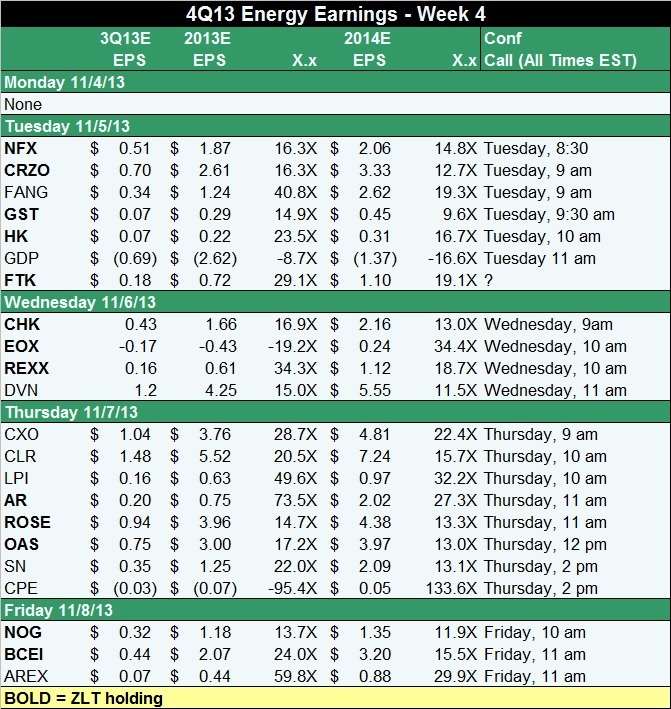 CHK was bolded in today's earnings calendar table. We do NOT own CHK. EOG reports this week also. CC on Thursday morning. Always a good listen/read. Thanks much, will add it to the table and repaste. Also will put the table on the Calendar tab for reference. SPWR now moving well after the earnings report selloff. FSLR continues higher following its report. #29 – Sharp well was drilled a while ago – TD was around May 1. SWN clearly took their time to get that one flowing. Re MHR note on Oct 25 – any additional thoughts? re 37 – Not one of my names, why is it running? RE 38: SCTY is one of the top 3 US solar names and they are all running. SCTY founded by Elon Musk, same guy who started Paypal, Tesla and SpaceX. I need to learn more about their model, but they install solar for low/no cost and collect revenues from the sale of the electricity. Don't know the details on it, but SCTY is a momo name and a crowd favorite. MHR – added to their Utica 11K acres. First hz well off 10-well Farly pad is flowing back. Lowered expectations for asset sales $220mm to $190mm. Lowering well costs $7.1mm to $6.4mm. Zorgnak – completely off topic – interested if could do a read on the BAC 4 year chart? re 40 – thanks Tom – keep the notes coming if you can, know there's an interest in Gary here. A bit busy at the moment with other stuff. MHR – Meeting today perceived as more of a "feel good" presentation rather than much new data output. sub freezing temps tonight and yesterday night on the East Coast. i would think gas prices would be more stable the cold evenings are more in line with late fall temps. Looks like the market is running up the stock prices going into the Q3 reports for many names this week, anticipating strong results. re 46 – on HK? re 44 – OAS, yeah, should be another solid quarter, decent chance of upgraded (modestly) guidance for 2013 here. Another name getting to free cash flow in 2014. Nesson deeper TFS bench test on this Q. See catalyst list for more. re 45 – Ah, hypotheticals. I'm in a core postion there built in a day, not huge yet. Planning on being longer there soon. I don't really care about the quiet period ending, at least not much as in 2 to 3 years nobody will really remember. I'd like some guys to come with Neutrals on it so I could get a bit more cheap but I'm listening this week for more adds (or not). By restrictions do you mean by people who took shares in the IPO? To that I'd say no. yes i meant IPO stock that may come unrestricted at 30 days and some folk may opt for profit taking. Will be like the ZLT C's (low churn, long term, fully invested) but starting from scratch. Since people ask "what would you buy now with new money?" I'll say that they will own likely own some FANG, some Bakken (probably 2 names, probably OAS or KOG and one other), probably WPX, and REXX or AR and then probably BCEI. So 6 names, maybe 7.
re 50 – Typically you're not going to lock IPO stock, I don't recall seeing any in this case. You try to put it with long term holders who won't flip but people will say they sell won't and then punt anyway on a good rally. There should not be anything special with regard to the end of the 30 days of quiet for the underwriters other than they can start publishing Buy and Neutral type reports. Given the run it had I would expect some to come with Neutral initiations but we do get another look at them this week for 3Q and I'd guess its a bit of a short call with no Q&A given the timing but don't know for sure. re 51 – ah, 3 month. re #41 OT Re BAC My take..
– SWN – only because I already own quite a bit of it just about everywhere else. Lots of interesting gassy names in the stable but I want to stick to about 70% oil for now. Also no Service names in there. These are going to be treated like the ZLT C, all trades shown from the beginning, small accounts at $10K apiece. HK is a completely different company since the takeover of RAM so I would not use techincals going back for them that far but I guess some might. SAC pleading guilty and paying $1.8 B fine but apparently no one going to jail and now they can just invest for themselves and not outsiders. Not far enough in my book. Stuart – also note it leaves out all the really little spec names. "Finance is the only industry where you can break all kinds of federal laws, make tons of $$$ doing it and just tip the gov't on the way out." HK – Added a trading position at just under $5.33. Earnings tomorrow. We should get more strong Bakken well results and potentially the same from decreased stage distance in Eagle Ford wells as well. We may get another Kibler area Utica well to think about and we might get 2014 guidance although they may hold it until December, just no way of knowing. It should become increasingly clear that they are looking to 2014 as a more drill bit intensive year leading with the Bakken and the Eagle Ford, then Utica followed by a picup in the Woodbine in 2H14. SEA,AX (Australian Exchange version of SDCJF) was +3.54% today on volume of 4.53 million shares. Ended at all time high. Volume 4 times three month average. Australian Exchange closed now because of time difference. Aussies seem to want that stock. E*Trade pretty aggressively pushing this new Goldman MLP fund (Goldman Sachs MLP Income Opportunities Fund) to customers like me (in the form of multiple emails). As reported by Flotek in October, the severe rains and associated flooding in Colorado in September had a meaningful impact on the Company's chemical sales in the Denver-Julesburg Basin ("D-J Basin") during the second-half of the month. After a complete review of all business, delayed orders and anticipated commercial activity, weather impacted the Company's commercial sales by more than $3 million, a large part of which would have been comprised of CnF® sales. In addition, while commercial activity has now stabilized to levels slightly above pre-storm levels, decreased activity continued into the first two weeks of October. While no business was permanently lost, entire drilling and completion programs in the region were notably delayed. Company A – "no really, you gotta pay up"
I don't know how many service guys have to see this happen to think it's a crap place to do business. Offtopicthirty – grabbing a run, back in a bit. GST: Venture any thoughts about what they will report tomorrow? Do you see any likely catalysts in this call? #70 — you could do Stand Up Humor in any bar in Texas. Priceless! GST — no numbers expectations… I leave that to the guys with detailed models. I'll be in meetings all day tomorrow, so will have to read the transcript. But I will be combing the verbage, peering for anything Russ et al. has to say about their 2 Hunton wells and one Woodford well where they have a very (very) small working interest. Any positive Woodford statements would catch Mr. Market by surprise. Also, looking for Hunton wells to IP at greater than 500 boe/d. That would make me happy. 73 – I would say the same thing about your comments, BOP. I think we all really enjoy your perspective, and #63 is a perfect example. RE 74: Thanks BOP. I'll be interested in hearing your take on GST sometime after it reports. Appreciate your contributions. Any rumblings on new mgmt in the offing? Perhaps brought in from outside pharma. A friend has a thesis that combines some new mgmt, an IND filing in Thyroid with a 3 to 6X polymer version, the reconfiguration certain patents earlier this year, and a little company with it's RA mainstay (Humira) coming off patent (ABT) that might have an interest in diabetes and thyroid markets in addition to to preserving its market leading RA franchise. I've watched this person go into painstaking detail on his holdings over the last 20+ years so I get excited with where his thinking is going, and I certainly don't discount it. I am kind of scared what the MHR print will look like later this week. Midstream was down for an awful long time! re 74 – yeah, what she said. I have no detailed model there so no numbers from me. I think it's more of a story thing for now, not yet a bottom line thing … big miss could cause a dip for sure but could be offset by operations update on Hunton wells 6 and 7 plus a timeline on results of (if they don't have them yet) their first operated well that spud back on the day of our call with them in late September. If they have Woodford news it might rub off a bit on OEDV, if it's close enough and that will get shouted out on Twitter I'm sure. LINE – Calling deal accretive even at higher price. re 80 – say that, guessing they mean in 2014 and nothing actually confirms that either your currency is pricey or what you are buying is really undervalued like being able to still make that statement after that kind of exchange ratio bump. 81 Had been accretive by $.42/sh at previous exchange rate. I guess alot of vigorish to work with. Hey Zorg – Noted EOG held a level you mentioned last week and bounced. Then noted the chart looks really familiar. Looks like OAS now. And many others with this pullback below the recent consolidative period after making all time new highs. KOG, BCEI, and more have this same group shaped pull back with large recovery today. Not that I mind the occasional green day and the volumes look nice this morning but it has a bit of a headfake feel to it to me. I was thinking that more short term types might use this as an oppy to punt … to me we need to do more side ways trading before crafting new highs. Got thoughts. Also nearly 50% increase in reserve balances with Fed banks since beginning 2013…wow. OT: eli #77 — i concur on numbers 1 through 3. #4 makes sense. And no knowledge of 5. 1) Looking for some interesting reading when proxy gets filed. (AGM around Dec 20th, so proxy should be out a month ahead of time). 2) Company has said they will file an IND. They have an isomer of the naturally-occuring molecule that seems to "work better." 3) 6mg time-release should be out any day between now and January. (NB: the Flint Study was completed with patients who took the non-time release version, 3x a day… and anatabine has been shown in mice to be much much more efficacious when you take a little bit continuously… so just think how great the results would have been if the patients had been given the time-release version). 4) Makes sense. Paul Perito may not be the best at wresting cash from tobacco companies, but his specialty in real life is pharma patents. 5) There are many pharmas who would benefit from adding the anatabine isomer to their drugs coming off patent. Just one of the ways we will all be aware of anatabine citrate in the future… it makes certain drugs "work better." And — more importantly to the drug manufacturers — gives them a new lease on an expiring patent. Energy best performing sector in market today. I believe the APC news has had a big impact. #86 I see what you mean. To my eyes all are variations on the high odds pullback/bounce setups I mentioned this morning in #2….Some of the better pullback setups had defined support, others not so much. The whole group is now above the volume pivot(supply) left behind after the recent drop and could see a day or two more of momentum, maybe more if small cap momentum continues back into favor beyond today. Noticing lots of momentum money moving back into last weeks beat down names in more than a few groups. Even the Chinese stocks are moving atoday. We have 76 of 80 energy stocks with higher than average short term volume…a pretty good bounce. So resumption of trend or head fake? Impossible to tell. re 91 – See, I knew I didn't have an original thought today. Thanks for the reads as always. We'll have a fresh set of ZLT Pies out in the morning. And comments on 7 reporting names of interest. The updated calendar in on the Calendar tab (note, EOG should be in bold on that table). Zorg – add REXX and ROSE to that list of chart lookalikes as well. Just taking a look at where we are overall on mix (oil vs gas) in the ZLT and it's closer to 80/20 when I flip some from gas to oil which is there focus (like a PVA that just tipped over or a NFX that will). Going to try to get that up by adding to things like COG and RRC over time, maybe to REXX though it's pretty big already read and probably not to SWN as it's #5 in the portfolios at this time. EOX launching into the report Wed with a similar chart. re 100 – yeah, wildly cheap in my model. Z, looking forward to all of your reports this week. Must feel like your in an arcade game with data flying at you from every direction. RE 102: sorry typo: s/b 'you're' not 'your'. Hate it when I do that. I do marvel at your ability to decipher and report to us so quickly all of the info that gets put out in these almost simultaneous reports. re 102 /103 – it's fun. And as long as a majority of them are kind of enough to report the preceding evening I don't get too cranky. TPLM has made the switch. I about begged HK to but not go there. I personally think it's stupid to wait unitl people 3rd cup of coffee to report at 8 am EST for a call an hour later. RRC starting to buck the natgas price doldrums and the mystifying downgrade from Barclays. TPLM – 30 minute slot with CFO now on Wednesday afternoon after market. I can't recall what I wanted from the guy at this point but will come up with a list, lol. They report their 3QFY14 in about a month. While I'm on a list of things people should do with their companies, another would be, get on a calendar basis. I take a prescription drug that prevents cold sores but most people will never learn about that effect because the drug is not approved for that. Yeah, they're kind of lonely in that move. KOG back over $13. Added a little Friday after listening to the replay. Congrats to those that added sub $12 as I was more of a mid $12 adder, just under where we sold trading positions early in the Fall. re 86, 91..glad the group bounced after last week's pullback…now I see how the momentum players jerk this stuff around and how it helps no one. re 110 – they do provide liquidity if you think something's too rich. re 111 – got near term thoughts, I have a few calls in the ZMT that would be pleased with a near term move on $55. S&P 500 …Looks like max chop til Thurs premkt econ?? FANG started slowly this morning but started to launch this afternoon into its report tomorrow. Similar chart pattern to the others. They already reported production numbers exceeding expectations and raised production guidance. Stock sold off anyway. Now bouncing again with the others. OT: DaveH — that is why Star is going to go the "drug approval" route… so they will be able to make those claims. And they are very careful NOT to do anything that the FDA would not like. People may not be fond of Paul Perito, Esq. as the COO. But the guy knows his way about the pharma and FDA world. And his professional reputation in those areas is solid gold. Oh yeah. And the head of Rock Creek, Dr. Curtis Wright, used to work at the FDA. So there are lots of things to worry about… but crossing the line with the FDA is not high up there on my list. This will be done properly (that is the hope, anyway). There are lots (and lots) of studies (not just thyroiditis) being conducted by doctors, proving anatabine's affectiveness across a broad swath of autoimmune disorders. The word will get out. But until they have pharma-status, Star will leave it to others to connect the dots publicly. re 115 =thank you sir. re 116 – we'll be on the replay there. XOP up 3%. Dragged down by the natgas and refiner names. Solar names are rocketing. TAN up over 8% reflecting a big move in the Chinese solar names. SCTY up 13.5%, SPWR up 10.2%. re 112..absolutely..and their exits can provide a good entry…and this site provides excellent information to help make those decisions….always harder for me to recognize when to lighten up than when to add to a position when its cheap. EPL bouncing with the group today, we'll do some work on it once it settles down, maybe try to talk with them again and weigh owning it in addition to EXXI for offshore exposure. re 120 – me too which plays into the longer term focus for 99% of what I do. NOG up 6%, 2nd best Bakken name on the day (after EOX). Don't get to say that often. Newfield Exploration (NFX): Q3 EPS of -$0.03. – They report CF from ops of $179 mm, didn't have a consenus ops number but it will be close to EBITDA plus Interest and EBITDA estimate was $172 so that's going to be about in line. What time does hk report tomorrow? HK what do you make of that downspaing diagram? HK no mention of what acreage $155.7m buys? – nice beat on 3Q13 volumes coming in at 130.4 MBOEpd vs 119.8 MBOEpd Street … US volumes look strong. domestic liquids up 9% sequentially. Nice. – $0.70 EPS vs $0.50 EPS expected but there's a little noise in the number as it includes discontinued ops and we don't how many analysts are keeping the international stuff in there until the time of sale or not. My guess would be that most guys are leaving it in until it's sold. – EFS still on track for a big 4Q ramp, expecting 8,200 3Q to jump to 12,200 BOEpd as 4Q avg. – Uinta came in 10% light due to refinery downtime, not drilling. Malaysia – said they signed the $898mm deal, closes early 2014. Favorite quote watch: "In February 2013, we rolled out a three-year plan and today we have year one behind us. We have even greater confidence in our ability to hit our corporate level targets and we intend to deliver on our promise of doubling liquids production from our four key plays by the end of 2015." PXD on the tape with an .08 miss but the stock is up big in AH due to strong well results and delineation successes. Pad drilling timing issues hurt Q3 but will help Q4. re 128 – 10 am EST. It's very small but that's a 1,280 and that's the direction people are headed. It's theorectical at this point, and nobody is ready to say that all three benches will work with that tight of a spacing just yet. On the Bakken people are testing that 7 well in the zone spacing but it's still early days. HK – whats with the impairment charge? Writing off the Woodbine or a chunk of Utica? GST has me sitting on the edge of my seat. Numbers are due out tonight right? re 138 – "Transfers of unevaluated Woodbine and certain Utica / Point Pleasant property costs to the full cost pool during the period contributed to the impairment charges. There were no additional proved reserves associated with these property transfers." – parts of both not getting drilled as rapidly as expected. Impairments are non cash so they don't impact cash flow. I think I mentioned before they are going to focus 2014 on the Bakken and EFS. % growth on 2014 comes from a lower starting point than the Street has … so 2014 is actually light vs the current Street. Early stage results from Halcón’s initial three well 660 foot Bakken downspacing pilot test in the North Fort Berthold area are promising. These three downspacing pilot wells recently came online producing an average of 2,665 Boe/d, which compares favorably to all other Bakken wells recently put online in the area. Based on these results, the Company has scheduled the majority of future drilling in the Fort Berthold area at 660 foot spacing. Drilling Bakken and Three Forks wells 660 feet apart has commenced on four additional pads with initial results expected late in the first quarter of 2014. In addition, Halcón plans to conduct initial Bakken downspacing tests in Williams County in early 2014.
re 145 – right from the pr, got a question on that? what does that do to inventory? re 147 – Depends on how they define northern … it won't be an insignificant add to their numbers … that's already know to be really good real estate, not really surprising that the tighter spaced wells are working fine for them there. At airport. Can't access GST PR. What were the rates on the 2 Hunton wells? Thanks. Sounds good to me!! re 151 – ballpark, they are probably going to be $400 to $500 mm short. Carrizo Oil & Gas (CRZO): Q3 EPS of $0.72 beats by $0.02. Carrizo Oil & Gas (CRZO) -5.2% AH after announcing a public offering of 3.75M shares of common stock. re 153 – yeah, not too shabby. anyone have a clue as to why ATHL was down today. don't see news or volume of any significance. re 158 – no new or filings that I see. Probably a broker comment. Would like to see it come in more as its on our list of things to consider in the Permian. Should be an interesting quarter. Young management team but I liked the way they handled the last call. HK is that impairment deducitble for tax purposes? re 161 – they're not going to be a cash tax payer for quite some time but it will get factored in, yes. 2 key wells on the call tomorrow. bop, howmdoes STSI compare to something like DNDN which I've seen go from $2 to $50 in a matter of weeks basically all the way back to $2?